There are no minimum age requirements for attendees. Typically shows are within a PG-13 rating. Our performances are improvised, so the content is largely determined by the audience and the suggestions you give. We don't avoid "blue" or adult humor but we try to be a little more creative with off-color suggestions than the obvious. 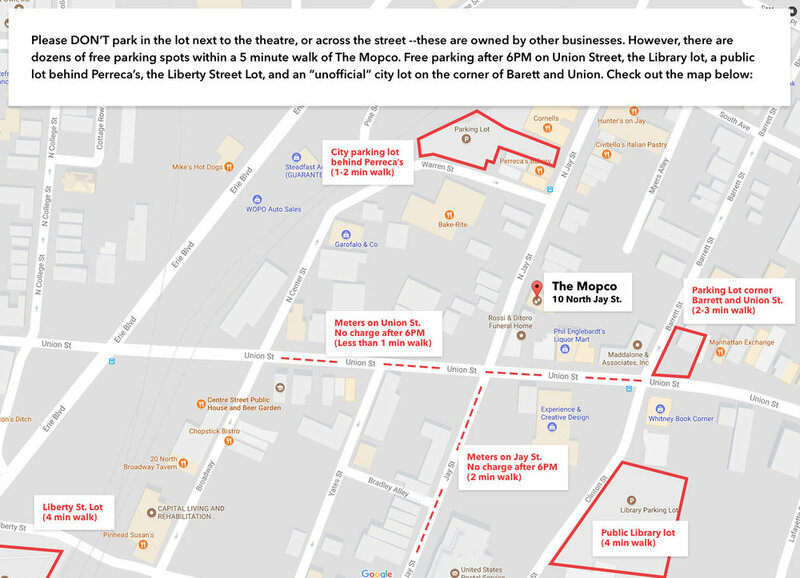 Street parking is available on Union and N Jay Streets by our theatre. Parking is available in the lot behind Pereca's as well as other public lots within a short walk of the theatre. The lot directly across from us is reserved for the Rossi & Ditorro Funeral Home and is not always available for parking. Find our more and see a detailed map of parking options available around us here. Please contact us 24 hours before showtime to be elligible for a full refund.